Sam started to sing at a very early age and from that moment on was hooked! She was part of various choirs as a young girl but singing and performing never became that serious until she reached the age of 21.Sam has now been a professional singer for the past 16 years, performing both as a solo singer and as part of various bands, in which she has supported The Drifters and Boney M, and comedians Jim Davidson and Mike Reid to name just a few. Sam is also well experienced in theatre and stage performing, she has been in numerous Pantomimes with lead roles as well as appearing in an episode of SKY ONE‘s Little Crackers as Anni-Frid from ABBA. Sam has an unbelievable vocal range and is a fantastic performer who likes to add in a bit of light humour to every performance. 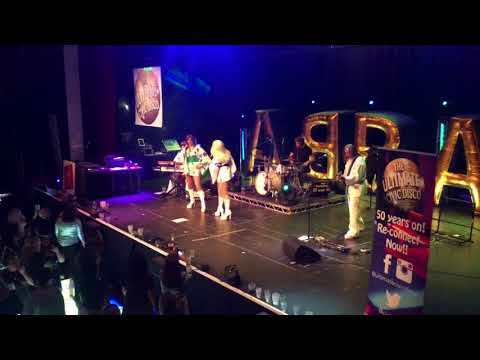 Whatever the act, be it Abba, 60’s, 70’s, 80’s or Function/Party sets Sam is a major asset to ABBA Re-Björn and Star Tribute with powerful vocals and spot on dance moves. – Resident Director/Swing in The Ratpack-Live from Las Vegas (Haymarket, Strand and Savoy Theatres, West End, US & UK tours). – Kate and understudy to Mrs Walsingham in Half A Sixpence (UK tour). Rusty in Footloose (European tour). Mamma Mia -The Concert (UK tour). The Talk of London and West Side Story (Cambridge Arts Festival and UK tour). As a Choreographer, Kelly has worked for TED UK for their Sensatori Resort (Mexico), Oklahoma! (Edinburgh Playhouse), Magic of the Musicals (UK tour), several pantomimes for PHA and shows for the Rank Organisation (Corporate Entertainment). On TV and film, Kelly appeared as Jemma in Escape to Paradise (Silver Touch Productions)), Children in Need (BBC Newcastle), The Antiques Road Show (BBC), Islanders (CTV), and Wish You Where Here (ITV). She has also presented for BBC Live, CCW Wordzone and Sky Internet. Her recording work includes the new musical Area 51 (Daniel O Brien). Toby was taught piano by the legendary pianist Big Joe Duskin, after a chance backstage encounter. He soon developed a keen interest in the piano from an early age which he has maintained to this day. Toby has played piano with Mungo Jerry for the past 15 years, he has had 3 top 40 hits and a top 20 album with former Brit Pop band Rialto. Toby has played previous tours with Katrina and the Waves and Go West and has appeared alongside Ben Waters, Charlie Watts, Booker T and the MG’s and Status Quo to name a few. Toby is also a qualified Music Therapist, and when he isn’t gigging, he works with children and adults with learning disabilities. As a highly experienced performer Steve has performed with many bands both here in the UK and in Europe plus, the Middle East and North America. 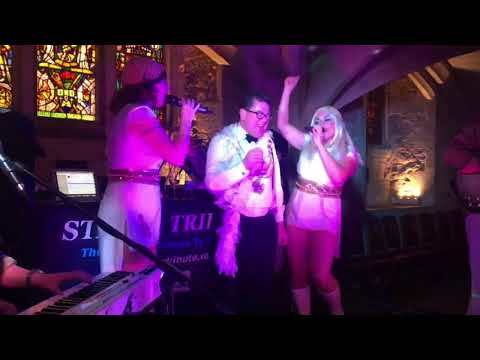 Steve has played many styles of music and has carved a niche for himself on the function and tribute band circuit. He is also known as a virtuoso performer on the blues scene with his own brand of high octane slide guitar and soulful vocals. As a graduate of the London College Of Music (LCM) Steve is currently working towards his Fellowship with the LCM. In addition to playing guitar Steve has added bass, double bass, ukulele, mandolin, banjo, harmonica, piano (almost as good as Les Dawson on a bad day) and a rather screechy violin to his musical abilities. Steve is also very useful with a spanner and has fixed many vehicles on the way to gigs. Some of the best stories include a fixing a tubeless tyre by the side of the road, using fencing wire to re-attach an exhaust, plus riding a bike and sidecar to get to a gig in the snow as the car was stuck on the drive! !